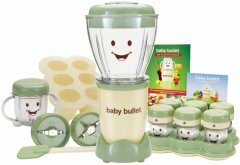 The Baby Bullet is the only Baby Bullet blender we have on file. This highly-advertised baby food blender comes with a batch bowl for big batches, a small cup for small batches, six date-dial storage cups with resealable spill-proof lids, two kinds of blades (a blending and milling blade), two kinds of trays (a batch tray and a tip-proof tray), and a spatula. Also known as: Baby Bullet Baby Care System.